As you may already know, i've been going a bit nuts with painting and letting out some of the art urges that have been building up and clogging the brain paths. I find i'm being incredibly productive, and i'm going to go ahead and ride that wave for now. This means that MAD SCIENCE! with Dr. Nick is taking a short break. We'll return on September 1st, a little under two weeks from now. And at that time, i should have a nice little gallery to put up, too. 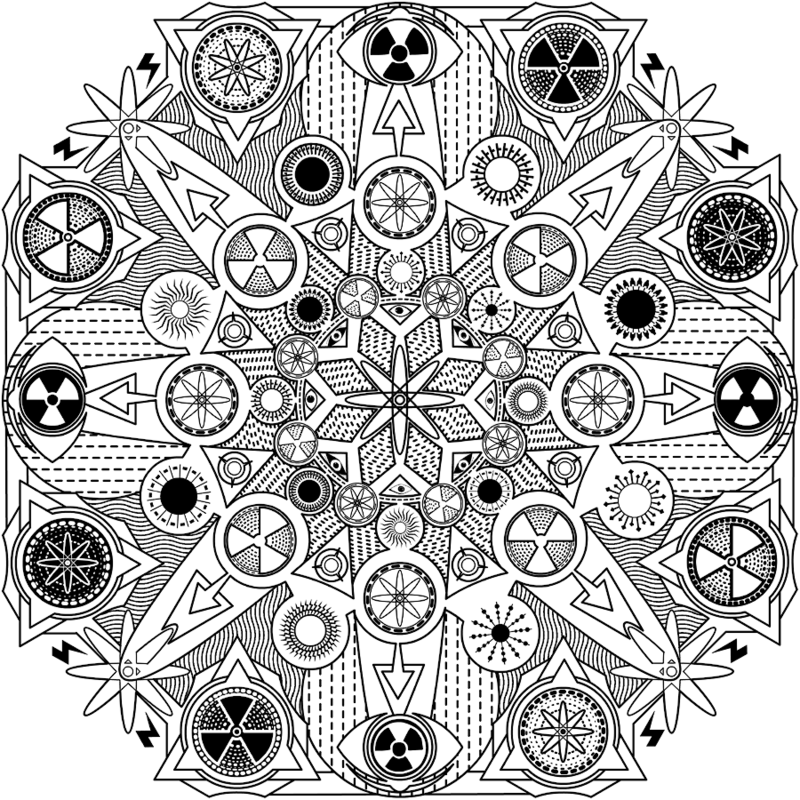 In the meantime, here's an Atomic Mandala that i spent today drawing for you to contemplate and find ... peace? Well, i'm going to find fun painting it. That is the best TV programming I've had in a long long time, perhaps since 1962-3 in Chicago when as a wee tot I'd be up at 4:30am to stare at the channel 9 screensaver (yes, I just wrote screensaver instead of test pattern; metaphorical hotwiring is a human norm) waiting for the 5am airing of the original Buster Crabbe Flash Gordon/Buck Rogers B&Ws. Now I know what it would've looked like if this raised-asMormon boy had had access to early morning coffee. I'll bet there's a secret diabolical message hidden in there somewhere. The FBI is trying to break the code as we speak. I meditated upon it, lost track of time and when I came out of my trance found myself under an elementary school desk with my hands over my head. I bet this is what they use to wake sleeper cells from Russia.